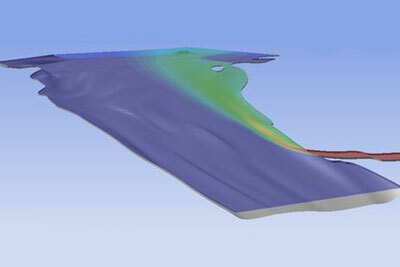 CFD modeling is an established player in the analysis of rivers. The Danish Hydraulic Institute among others has developed 2-D software for investigating extensive river and flood plain systems. Likewise, the US Army Corps of Engineers has a freeware package available called HEC-RAS for 1-D river analysis. 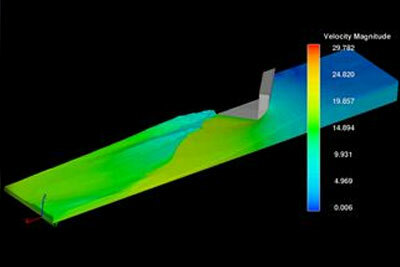 Computing capacity limits detailed 3-D models to river sections up to one or two kilometers in length. This limit is steadily increasing, particularly with our access to high performance computing facilities. Open channel flows typically involve swiftly moving streams with velocities great enough to result in significant surface displacements or even water flying through the air. These are simulated with time dependent free surface models. Estuaries – Temporal models with tidal inputs simulate systems where fresh and sea water may be mixing or stratifying. Inflow tracking – Species models show concentration and dispersion of pollutants. Fish migration facilities – Fish species like salmonids rely on subtle changes in downstream current to find and make their way through bypass facilities at hydroelectric dams. 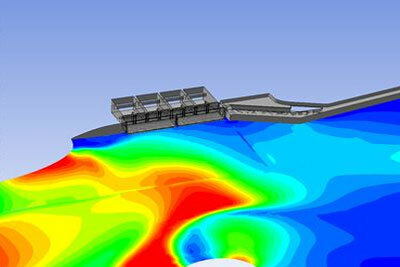 CFD models for bypass facilities replicate flow patterns in the dam forebay region and critical areas near the separation screens. Erosion and scour – At Ibis Group, we are offering simulations where shear levels on the bottom and banks of rivers are documented. These simulations indicate regions where erosion and scour will occur. They will also indicate where sediment deposition will take place. 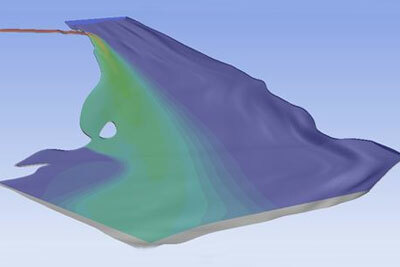 At present, we are not offering simulations that replicate actual erosion and sediment transport.